A few weeks ago, our mushroom foraging friend, Rick advised our son, Will to keep an eye out for hen-of-the-woods mushrooms at the base of oak trees. Will, who is quite good at spotting things, eventually found a truly enormous one growing from the base of an oak tree at his grandma's house next door. So we went for a walk in the woods to retrieve it a few days ago. 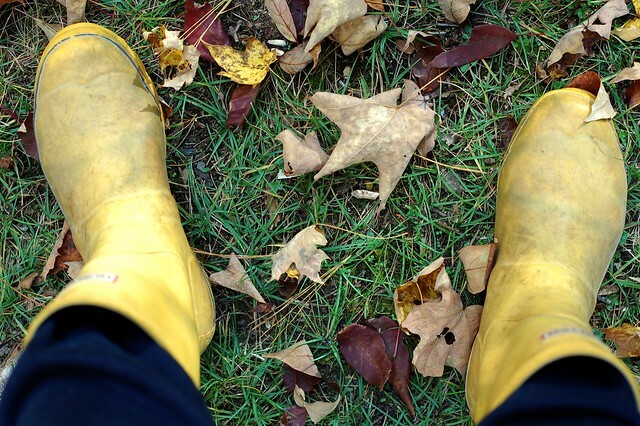 I wore my rain boots because they give me the illusion of invincibility - like I can go anwhere and do anything without getting my socks wet or bitten by ticks or scratched by thorns. We went a little ways down the hill and Will pointed out his find. The mushroom was BIG. However, I've read that these mushrooms can grow to at least 50 pounds so it's all relative. Will was very proud of his find. I was, too. Here he is with a little piece of the mushroom. I often ask him, "Why are you so cute?" and he always responds, "Because I'm yours," which has always impressed me since I think it basically sums it all up. 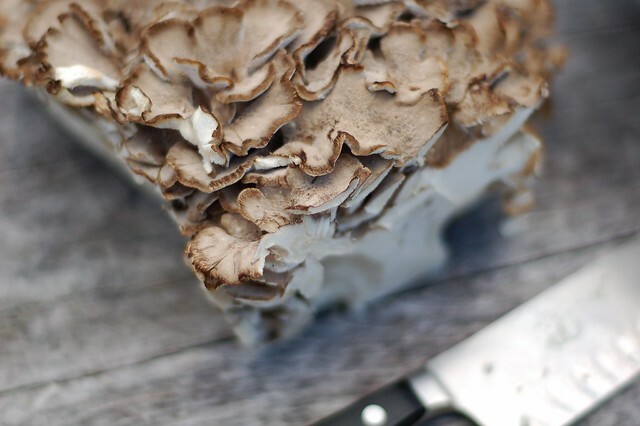 Hen-of-the-woods (Grifola frondosa) is native to the northeastern U.S. as well as Japan where it is known as maitake - the "dancing mushroom" because people were supposedly so happy to find it that they would dance for joy. It's not poetic but it reminds me of a brain - especially on the inside. And it was a surprise to find a few centipedes and a salamander curled up in one of the mushroom's little cavities. Luckily, it was not hard to relocate these guests. The flavor is fantastic - so much depth and richness - it makes you realize that those white button mushrooms you get at the store taste like absolutely nothing except what you cook them with. Maitake is a pretty meaty mushroom and can stand up to long cooking. I like it cooked with some liquid to make it more tender. Thus far, we have eaten it sauteed with butter, garlic, thyme and oregano (MWAH, so good!) and also in a mushroom risotto (also delish.) And there's still quite a bit to use. I may end up freezing some. In addition to tasting good, this mushroom seems to have both nutritional and medicinal benefits. It's rich in potassium, calcium, and magnesium, vitamin B2, D2 and niacin and amino acids. Memorial Sloan Kettering has done some clinical trials that indicate the mushroom has the power to stimulate certain types of immune cells. 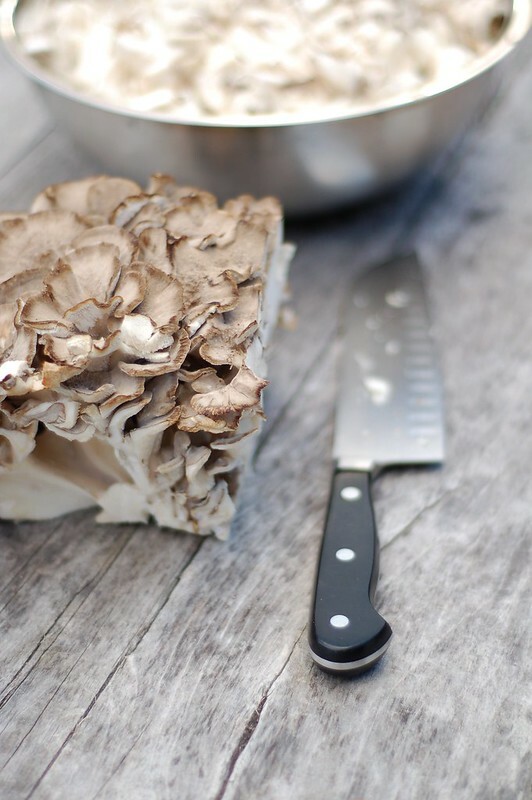 Maitake also appears to help regulate glucose levels which can be helpful in managing and preventing Type II diabetes. Paul Stamets wrote an interesting article about maitakes which goes into a little more depth. 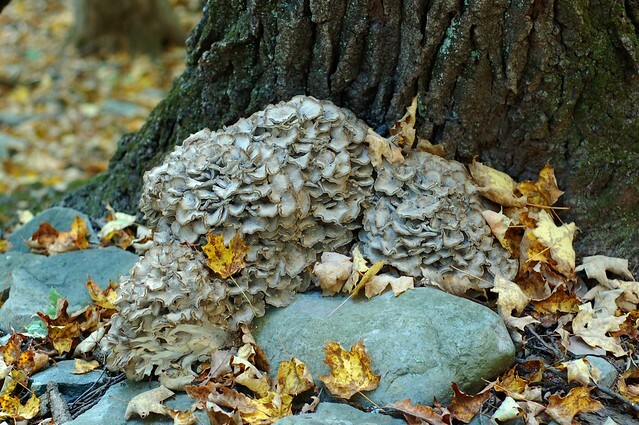 Right now is a good time to look for hen-of-the-woods as they like warm days and cool nights. 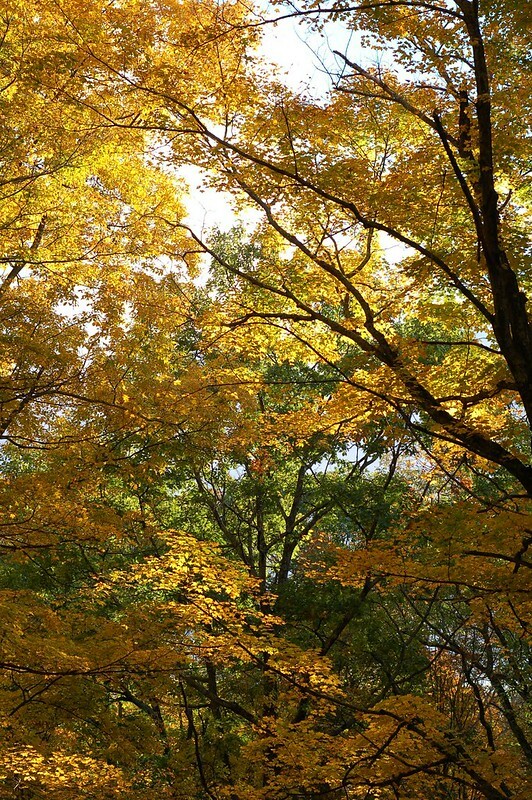 Look at the base of oaks, elms and maples (but mostly oaks) in the forest. And you needn't be afraid of accidentally poisoning yourself because there are no poisonous look-alikes. Which is always nice. 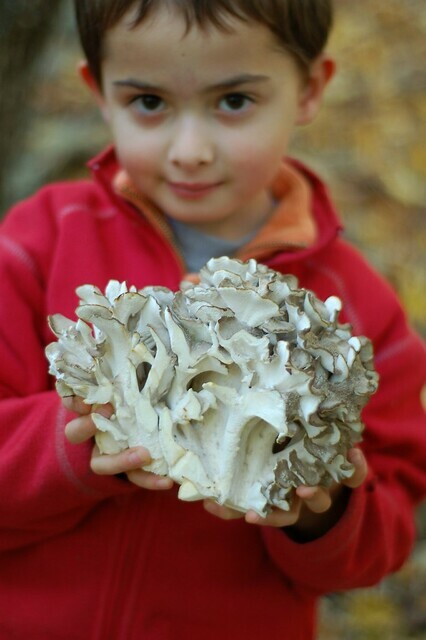 3 days ago I picked a good bit of hen of the woods. Now it has a smelly sock odor in the fridge. It looks the same as when I picked it. I moved it out of the fridge outside for a few hours and now the smell is faint but still there. Is this normal? How quickly would you process them? I figured three days would be ok. What do you think? I am really not an expert on mushrooms but have had this one around for about a week (not in the fridge and not in a plastic bag) and it's still good. I can't imagine that it would go bad in just 3 days but it may not be happy about being in the fridge? I have frozen some of the one I harvested after sauteeing it and have been told that you can also just cut it into slices and freeze it that way, if you prefer. And many people dry it, too. Good luck! thanks Eve, I think I'll try it anyways. I'd like to add, after boiling a bunch for stock, I noticed that it looks exactly like chicken. Texture too. Just like my "old hen" soup. let me know how it goes! And, I agree, it's a pretty "meaty" mushroom. I sauteed some to eat immediately. The rest I rinsed, boiled, and then in the freezer. The smelly sock odor did not carry over in the cooking or boiling. I think you were right about the fridge not being the ideal place. Not enough circulation. I thought I could see the beginnings of mold. Despite the daunting smell, it really did turn out fine. I'm glad I didn't toss them. I wonder if they spray store bought mushrooms cause they never go bad in fridge. They usually just dry out. That's great! I was waiting to hear about Will's find. Did he enjoy eating it? He normally does not like mushrooms (ironic, I know) but he loved this one! The best producing hen of the woods tree in maine is located at the Spirit Pond Preserve Phippsburg land trust trails in Phippsburg maine. every single year this ancient red oak produces at least 50 pounds of prime grade A hen of the woods, maitake, grifola frondosa, g. frondosa mushrooms! Hen of the woods seems to be independent of drought conditions. Though after years of hen hunting, I have only found hen-of-the-woods mushrooms within 200 feet of water, whether that be salt water or fresh water, or brackish water. Often times the old oaks where they are found are immediately on the edge (even overhanging) of a body of water, and frequently near tidal areas along the coast of maine. The Spirit Pond oak tree produces from the middle of September to the middle of October every single year, and has done so for at least the last 15 years and probably longer. 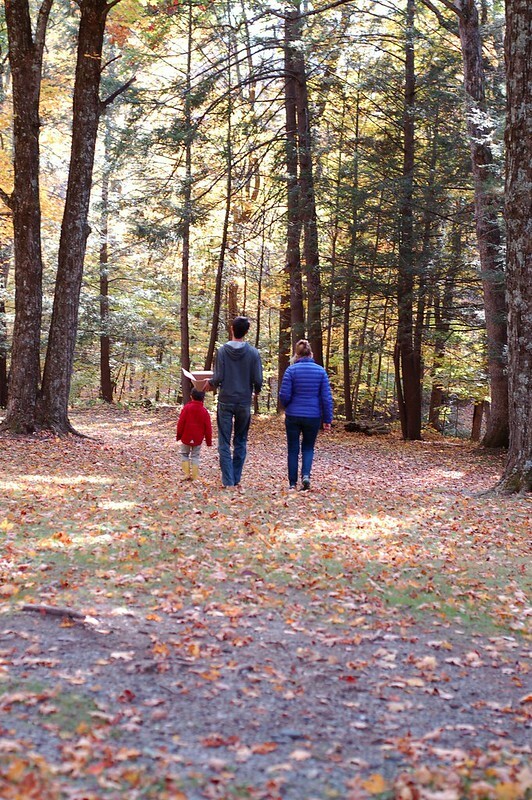 The tree is located toward the beginning of the spirit pond trail and about 200 feet from spirit pond at the site of an old homestead and near the spirit pond burial ground. the tree fell directly over a portion of the trail in 2015 but still grows hen of the woods mushroom from the remaining stump, around the stump and from the base of the fallen tree itself in huge numbers and size. Check this tree frequently during the season as it is well known locally to grow hens. 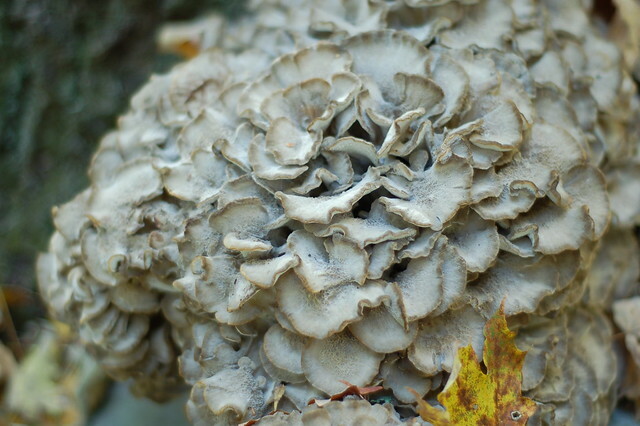 Where to find the second most productive hen of the woods oak tree in maine is at the Center Pond Phippsburg land trust trail in Phippsburg maine. It is located at the edge of center pond just opposite the beaver pond along the main trail. The preceding geo-location in this instance is exact. The fallen trunk of this tree can be seen on google maps satellite view. This grifola frondosa supporting red oak tree has grown mushrooms as late as mid November and particularly on, and inside the hollow portion of the fallen tip-over dead section which actually rests in Center Pond itself. 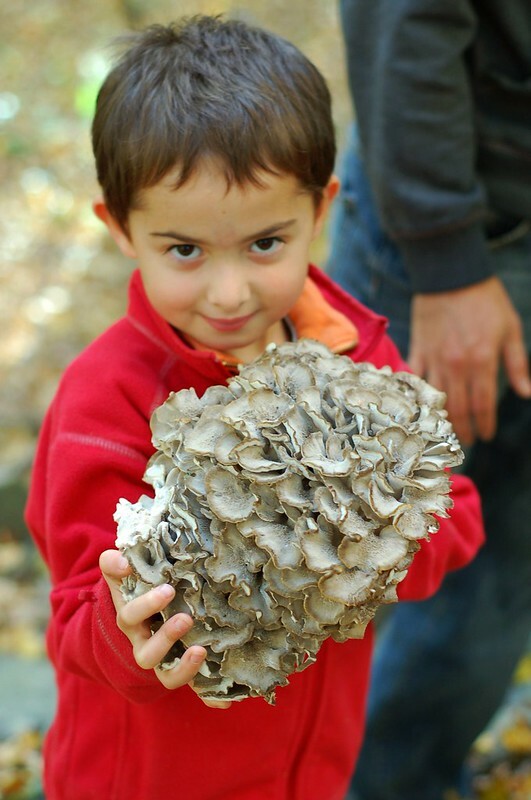 The hen of the woods that this tree produces range from 10 - 20 pounds. this tree is easily accessed and well known, so the maitake go quickly. if you're the lucky one to get a 15 pound hen of the woods from this tree, you'll understand why it's called the dancing mushroom.